Americans are the largest consumers of hamburgers, eating 13 billion a year. Lined up, they’d circle the earth 32 times. Along with ground beef, the perfect hamburger includes a bread bun covered with toasted sesame seeds. In the 1920s, a young cook in Pasadena added a thin slice of cheese to the hamburger he was preparing. And behold: the cheeseburger was born. In 1885 one of the first hamburger vendors would sing out: “Hamburgers, hamburgers, hamburgers hot; onions in the middle, pickle on top. Makes your lips go flippity flop”. Harry Sperl sacrificed his Harley Davidson in order to transform it into a Burger Trike: the whole body is now in the shape of a hambuger. Becoming widespread in the ‘80s, among the most popular fast food chains is McDonald’s – whose best-selling sandwich is the Big Mac. In the early 1800s in the German port of Hamburg, the first beef meatballs were consumed. It was the Germans who brought hamburger into the United States. The hamburger’s only true rival for the most beloved fast food is the hot dog. And even its original name, Frankfurter, evokes Germany. It’s the most extravagant sauce that tops a hamburger, with ingredients like soy sauce, pineapple juice, rum, honey and mustard. Because they’re often made with fat and preservatives, with a high calorie content, hamburgers have become the emblematic junk food. The precious Japanese beef, Kobe, is the main protagonist of the world’s most expensive hamburger, which comes with truffle and foie gras, costs 5 thousand dollars and is served at a Las Vegas casino. 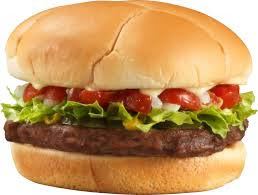 Hamburgers are also called “the Liberty sandwich”, because in the First World War, the American soldiers also called Sauerkraut “Liberty Cabbage” so they wouldn’t have to use the German word. It was only in the 20th Century that meat grinders became widespread. Before that, they were made from wood and tin. In the U.S. there are several days to pay hommage to this special steak, while May is considered the official month to celebrate both hamburger and barbecue steak. Sliced onion and tomatoes, a lettuce leaf, and a variety of sauces like mustard, mayonnaise and ketchup are the common toppings for the world’s most famous sandwich. The most gluttonous cartoon hamburger fan is Poldo (J. Wellington Wimpy), from the Popeye show. This is the price in euro for a test-tube hamburger, made from artificial meat, perfected after years of research in Holland. It was first cooked by the 3-starred Michelin British chef, Heston Blumenthal. 1999 there were more than 25,000 McDonald's in 115 countries. 8.2 Billion burgers were served in commercial restaurants in 2001. The record for the largest hamburger is in Seymour, Wisconsin in 1989 and that the weight was over 5000 lbs. To this day it is uncontested. The Hamburger hall of fame is located in Seymour, Wisconsin. On average, Americans eat 3 hamburgers a week. June is the biggest month for beef sales in restaurants, with nearly 800 million pounds of beef consumed in this month alone in 2005. White Castle was America’s first fast-food hamburger chain. In 1921, a burger from America’s first fast-food restaurant cost 5 cents. The best way to cook and serve a hamburger is medium rare: crispy outside and pink inside. In Italy, hamburgers are also called “Swiss” because this kind of beef often comes from that neighboring country. The first popular hamburger critic was the writer Upton Sinclair, in his 1900 novel “The Jungle” in which he denounced the terrible conditions in Chicago slaughterhouses. It's the New York fast food chain that launched the hamburger with the “fifth” taste, Umami. Instead of meat, vegetarian hamburgers are made with soy, special chickpea patties, or else various mixtures of legumes and spices. The Walla Walla Washington newspaper was the first, in 1889, to report on the existence of the hamburger. There’s a very flavourful sauce called “x-tra cheese”, which mixes together American and Swiss cheeses. The 96 oz hamburger is served in a pub in Pennsylvania, and comes garnished with 2 whole onions, 12 slices of cheese, half a head of lettuce and lots of sauce. A delicious alternative to burgers can be grilled or fried zucchini slices served in a bun.